It’s easy to get excited about one of the biggest sporting events in the world when you’re an Official Sponsor. But for others less familiar with Rugby World Cup 2015, it might not be the same case. Coca-Cola picked up on this and decided to team up with four rugby legends to help others get a kick out of the sport too, and did so in way you might not expect. At Potters Field Park, a busy London location next to Tower Bridge, we gathered Home Nations rugby stars Mike Tindall, Thom Evans, Emily Scarratt and Natasha Hunt, and put them through their paces by having them lead a one-day ‘Ball Amnesty’. 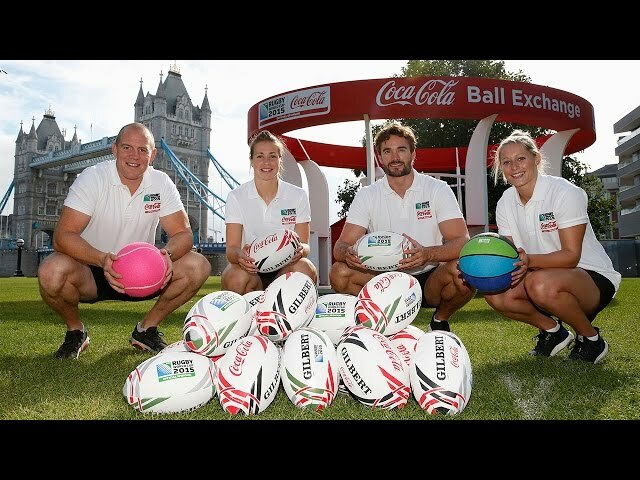 Londoners were asked to put down their rackets, clubs and bats and trade in their tennis balls, footballs and basketballs for a brand new Rugby World Cup 2015 Coca-Cola Gilbert rugby ball instead. The exchange was as a timely reminder of the upcoming Tournament, and encouraged passers-by to choose rugby over their usual summer sports. The four players also gave fans a run for their money, as they took on a special challenge and taught onlookers some basic skills. The pop-up was another attempt from Coca-Cola to spread rugby fever, following their recent Win a Ball promotion, and ‘How To Win A Rugby World Cup’ film, which also features Natasha Hunt, alongside Jason Robinson. “We know that major sporting events have the ability to inspire people to get out and play and so we want to use our sponsorship to help people do that by putting rugby balls in the hands of people up and down the country.” Paul Dwan, General Manager of Coca-Cola’s Rugby World Cup 2015 team. The exchanged equipment will be donated to StreetGames, Coca-Cola Great Britain’s charity partner which brings sport to the doorstep of young people in disadvantaged communities across the UK.